Are you as anxious as I am to read all the news from Houston? Fall Market is over and the show begins tomorrow. Sharon over at Red Geranium Cottage has already begun what are sure to be great market stories - can’t wait for more, Sharon! I am on pins and needles (hmmmm….was that an intended pun?) to see what are sure to be fabulous new designs for the coming year! What I would give to be a fly at quilt market! Maybe someday I’ll get a part-time job in a quilt shop and be the person picked to attend market with the shop owner - how cool would that be??? For now I anxiously anticipate all of the great blogs to come about the show and many thanks to Kimberly over at the Jolly Jabber for giving us a play-by-play while she was at market! I need a new stitchery to work on in the evening since I have finished all of my Winter Wonderland stitchery’s. 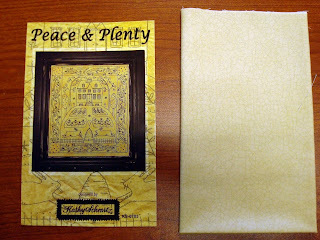 I searched through the drawers last evening and decided this Kathy Schmitz design would be the next one. Sorry for the not-so-hot photo - I took it at work where the fluorescent lights wreak havoc when you're taking a picture! I’ll be tracing the pattern onto this Moda Crackle. My husband is part Polish and Easter is almost a bigger holiday than Christmas in his family! I thought the bunnies in this give it a decidedly Easter theme and I ought to have it finished and framed just around that time! The pattern calls for one strand of embroidery floss, but I plan to use my new favorite thread for Redwork - Aurifil 12/2. The only place I have ever found it is Red Rock Threads or at quilt shows. I look for it in almost every quilt shop I visit, but I haven’t seen it yet! It threads a needle well, doesn’t twist and sews like a dream! I just posted part 2 on my blog. LOL I've got lots more to show and tell. It's so much fun to see the latest and the greatest. Yea, one day I'll be at market! lol I can just imagine how disciplined one must be! I'd be blowing some budgets big time! lol Keep well!